Unwrap the cream cheese from the packages and place in a large mixing bowl. Cover and let stand to room temperature, which should take at least an hour. Melt the butter in a small saucepan that is set on medium heat or microwave it in a covered, microwave safe dish. Add the graham cracker crumbs, granulated sugar, and ground cinnamon to the bowl and stir gently with a fork. Stir in the butter using a wooden spoon until the dry mixture is just moistened. Using your fingers, press the mixture into the bottom of a 9-inch springform pan. Set aside. Beat the softened cream cheese with an electric mixer set on medium until completely smooth. Add pumpkin purée, eggs, egg yolk, sour cream, granulated sugar, and spices and beat until creamy. Add flour and vanilla and beat until completely incorporated. Pour carefully into the crust and spread it evenly using a rubber spatula. Place in the center of the preheated oven for one hour. Remove from the oven and let sit in the pan for 15 minutes to let it cool. Cover the cake with plastic wrap and place in the refrigerator for at least 4 hours. Remove from pan just before serving. Scary Spider Cheesecake: Prepare the pumpkin cheesecake recipe listed above. Place black plastic spiders on the cheesecake to decorate it for Halloween just before serving. Chocolate Pumpkin Cheesecake. 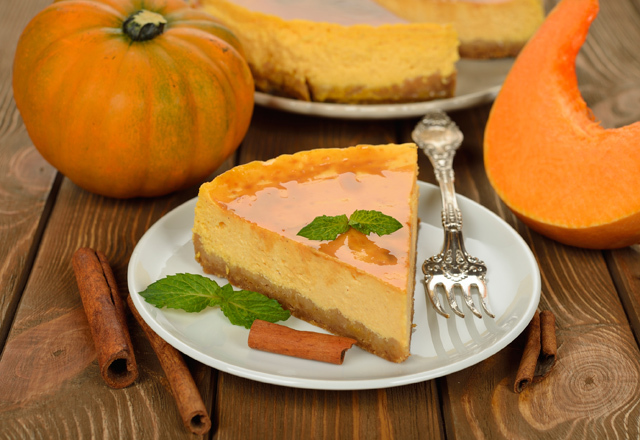 Prepare the pumpkin cheesecake recipe listed above. Use chocolate graham cracker crumbs instead of regular graham cracker crumbs when preparing the crust. Refrigerate the cheesecake for at least two hours. Melt 1 cup semisweet chocolate chips over a double boiler or in the microwave. Mix in ¼ cup of unsalted butter. Stir until melted. Let cool for five minutes and then spread mixture over the cheesecake. Pumpkin White Chocolate Cheesecake. Prepare the cheesecake recipe as directed. Stir in 1/4 cup melted white chocolate with the cheesecake filling just before pouring into the spring form pan. Drizzle melted white chocolate over the cheesecake just before serving.